Adeleine, or Ado in Kirby's Dream Land 3, is a main character from Kirby 64: The Crystal Shards and Kirby's Dream Land 3. She is fought as a boss in both these games, and both her boss fights show off her unique skill: the ability to bring life to her paintings and have them fight on her behalf. She is considered to be the only "human" in the Kirby world. It's said that Adeleine went to Pop-Star (Kirby's home planet) to study art. In Kirby Star Allies, she makes a team with Ribbon: Ribbon is a fairy from Ripple Star. During the events of Kirby 64, she escaped from her planet with a magical crystal, to protect it from a Dark Matter invasion. 3 Dark Matter blobs reached her and broke the crystal into shards, scattering them through the universe. Ribbon landed on Pop-Star; there she found Kirby, who helped her to find all the crystal shards and to fight Dark Matter. During the adventure, they also met Adeleine, and that's when the friendship between the two character began. Together, Adeleine and Ribbon can fight by summoning creatures from the canvas, and by using the powers of the crystal! Adeleine, the painter girl from Kirby 64, has the ability to summon whatever she draws: her moveset is full of references of Kirby characters and games. Additionally, she has a couple of tools that allow her to keep the enemy at a distance. Ribbon (fairy) lets Adeleine use the crystal as a weapon or even as a veichle. This character has long range powerful attacks but she's physically weak; to balance this, she fights in an elusive way. Adeleine (or Ado) appeared for the first time in Kirby's Dream Land 3; in the normal game she is just a boss, but if you get to the true ending, you can see her having a moment of spotlight: The credits cutscene features Ado surrounded by every other major character of the game. In that scene, she is portrayed as the main character, while the other characters (including Kirby) are her crowd, watching her while she draws pictures of them and other characters who appear in the game. Ado is also the character who writes "THE END" after the credits. In the last level before Ado's bossfight, there are some sketches of enemies on the wall, who become alive when Kirby gets close to them: even if the game never states it explicitly, it's easy to assume that those sketches are also made by Ado. In Kirby 64 she becomes a main character. During the events of the game, she joins Kirby and helps him to fight Dark Matter. In the minigames, she is a playable character. One of the beta builds of the game featured a playable Adeleine in the main mode (along with the other characters, Waddle Dee and King Dedede), but the feature was removed from the final game for some reason. In the final game, she only appears in the cutscenes, and occasionally in the background of the levels, drawing food and 1up for Kirby. At the end of the game, the four main characters (Kirby, King Dedede, Adeleine and Waddle Dee) receive a reward from Ribbon and Fairy Queen, for having saved their planet and restored the crystal: the queen makes a ceremony for them and gives a crystal pendant to each hero. Adeleine disappeared from the Kirby series, completely. Apparently, during the development of the Kirby anime (Hoshi no Kirby/Kirby Right Back at Ya), Sakurai himself (the creator of Kirby and Smash Bros) said to the anime staff that he didn't want to see any human character in the show; many fans think that this is the cause of Adeleine being neglected for many years after Kirby 64, though there is no proof of this, it's just fan speculation. Some fans even thought that Adeleine was retconned and she was not canon anymore, along with other characters from the trilogy of Kirby games directed by Shinichi Shimomura (known by the fans as the Dark Matter trilogy, that includes Kirby's Dream Land 2, 3 and Kirby 64). After many years, Adeleine started to appear again, in small cameos and references; This happend after the 20th anniversary of Kirby, when HAL released some commemorative material, and started to include a lot of references from old Kirby games in their new games. In Kirby Triple Deluxe, Adeleine (as Ado) appears in two rare keychains. Despite this, she remains unnamed: one of the keychains represents the Boss Butch mode of Kirby's Dream Land 3 (Ado appears along with the other bosses), and the other is just called "Sweet Stuff Drawing", despite Ado being in the picture. Despite how minor this cameo seems to be, it's still very important in the history of the character, because it's the first time Adeleine appeared in a Kirby game since Kirby 64 (excluding portings of old games such as the Dream Collection, a commemorative collection of classics made for the 20th anniversary). Amiibo Tap, a game on WiiU that allowed players to use the Amiibo statues to unlock demos of Virtual Console games, included Kirby's Dream Land 3, and it features a scene dedicated to Ado's bossfight. In Kirby Fighters/Kirby Fighters Deluxe, Adeleine's boss theme from Kirby 64 is used as background music in the ability select screen (despite this, the actual character is still not referenced in the game); the minigame from Kirby Triple Deluxe uses the regular version of the theme, while in the "Deluxe" stand alone version the theme is a remix. According to some dataminers, the the name of the audio file of Adeleine's theme is called "Ado K64": this is a first unofficial confirmation that Ado and Adeleine are supposed to be the same character, as if it wasn't already clear enough. Previously (still for the 20th anniversary), HAL released the Kirby Encyclopedia: in that book, there is a part dedicated to Ado/Adeleine; they stated that it's unknown if Ado and Adeleine are the same or not, though it's possible that Ado is just Adeleine's nickname (they left it open on purpose, but it's suggested that they are probably the same character). In Kirby Planet Robobot, Adeleine got a rare sticker; this time, she has got her name as well! Something is finally changing, they are not hiding her anymore. Later, in Team Kirby Clash Deluxe, they used the music from Adeleine's introduction cutscene (Kirby 64) for the Miiverse and Amiibo screen (sadly, the character is still not referenced in the game). To celebrate the 25th Anniversary of Kirby, and HAL created a Twitter account. On Twitter, HAL published a series of artworks featuring several characters from the Kirby series, including some very obscure ones. Adeleine appeared in several of those artworks: this is the first time that Adeleine got new official artworks since Kirby 64. Adeleine appears in the picture they used for the banner! Later, in the same day, they released a 3DS theme based on that picture. To celebrate the 100000 followers of the Twitter account, they also released a special artwork with a different format. Adeleine didn't appear in it, though they said that she was the author of it, and implied that all those commemorative pictures were made by her (according to the game universe). Kirby Star Allies came out, and it featured the Artist ability. unlike Paint from Kirby Superstar, that was mostly influenced by Paint Roller's design, Artist seems to be based more on Adeleine: Kirby does the same movement as her when he summons the painted creatures, and he wears a red beret like her too. Adeleine is also featured in one of the in-game artworks, the one representing Kirby 64: The Crystal Shards ("A Delicious Picnic" by Kouichi Ooyama). They announced a series of free DLCs for Kirby Star Allies: the DLC add some playable characters to the game, in the form of "Dream Friends". At first, only 3 characters were announced: Rick, Coo & Kine (as one character), Marx and Gooey, though they said that in the future more characters would have been added. 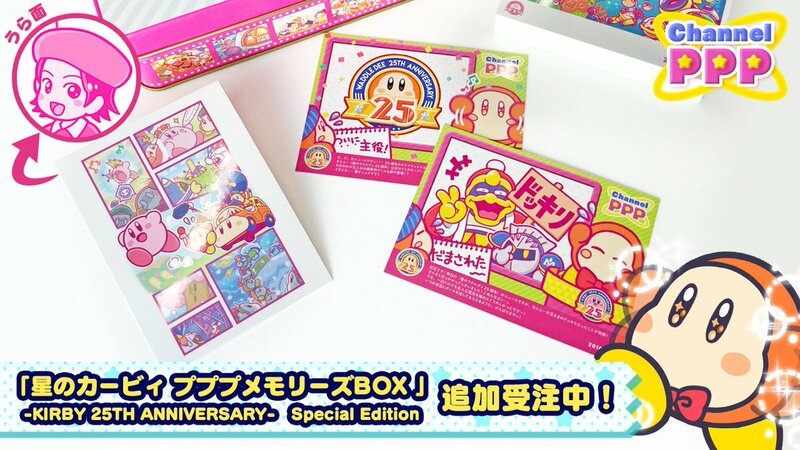 After 1 year since the opening of the Twitter account, HAL made the Pupupu Memories Box, a box containing all the artworks published on Twitter during the year, in the form of postcards/Polaroid photos. Adeleine is featured in 5 of those artworks, but that's not all: the Special Edition of the Pupupu Memories Box (a limited edition) included some additional artworks, one of which is the one made to celebrate the 100000 followers. That artwork, said to be drawn by Adeleine herself, has an Adeleine stamp on the back side. She's getting relevant again! The second wave of Dream Friends came out, and it features Adeleine! Adeleine is finally playable in Kirby Star Allies, with Ribbon as part of her moveset. She summons creatures from the Dark Matter trilogy (drawn in a style that reminds of Kirby's Dream Land 3), and her shield move shows artworks from the map screen and the credits cutscene of Kirby 64, making more evident that Adeleine represents the crayon art style of Dream Land 3 and Kirby 64. The move that allows Adeleine to ride a boss drawing is called Ado's Painter. This is another confirmation that Ado and Adeleine are the same character, this time it's official and in-game. For each set of characters, a new artwork has been added in the in-game gallery; While each artwork usually represents the 3 characters that make part of the set, Adeleine is an exception: in fact, while Daroach and Dark Metaknight share the artwork together, Adeleine has a separate artwork all for herself, representing her and the rest of the Kirby 64 crew: "Chasing Our Dreams" by H.M. (HAL Laboratory, Inc.). POSSIBLE STAR ALLIES SPOILER! 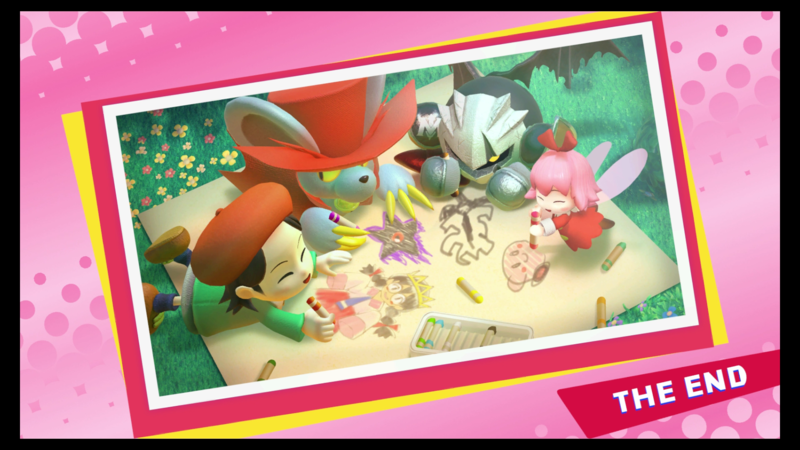 The picture at the end of the Guest Star mode of Kirby Star Allies features the 3 characters from the second DLC drawing stuff with Adeleine; the picture is the same for all 3 Dream Friends. This is a reference of the true ending of Kirby's Dream Land 3, mentioned at the beginning of this article. Another move of Adeleine is Ribbon's Crystal: it's the crystal gun, a final weapon formerly used by Kirby against the final boss of Kirby 64. The weapon is now used by Adeleine and associated to her character. As mentioned before, Adeleine can draw any sort of creature and bring it to life. This simple ability clearly sets her up to have a summoner moveset in Smash. Also, with a bit of creative liberty, Adeleine could also represent Canvas Curse and Rainbow Curse, due to both games involving a magical paintbrush, which can be implemented as a rainbow line extending from the paintbrush, allowing Adeleine to use it as a whip or tether or a number of different uses I specify in my moveset idea. Similarly to how Metaknight takes inspiration for Sword and Wing Kirby abilities and Dedede from Hammer, Adeleine could also take inspiration from certain Kirby abilities, namely Beam or Whip as her paintbrush and rainbow line can replicate most of those copy abilities attacks pretty well. She could also take inspiration from the Paint Roller boss as he also has the ability to bring drawings to life; Additionally, Kirby Star Allies introduced the Artist Ability, and added Adeleine (& Ribbon) as a playable character with her own moveset. Ribbon allows Adeleine to fly and use the Crystal Gun, a crystal shard shooting gun created with Ripple Star's crystal, used by Kirby against the final boss in Kirby 64, and by Adeleine as an aerial move in Kirby Star Allies. In the cutscenes of Kirby 64, the crystal is also shown to have more powers, such as being able to fly at high speeds similar to a warpstar, create portals to different planets, shoot lasers: all of this can be implemented in Adeleine's moveset to add more variety and expand her options. Entrance: A black door frame gets quickly drawn onto the background, as Adeleine steps through it onto the battlefield. Jab: 2 slaps with the paintbrush. Quick and basic. Ftilt: Smack forward with the pallet. Utilt: ZSS old Up B with less range. Dtilt: Rising swipe with the paintbrush. Good combo starter. Dash: Does a rainbow line version of the Beam Kirby's Cycle Beam, the dash attack from Team Kirby Clash Deluxe. 3 hits. Fsmash: Vicious smack to the ground in front with a rainbow line. Usmash: 3 swipes upwards with the paintbrush. Dsmash: Whips the rainbow line along the ground around her. Nair: Spins a rainbow line in a wide arc all around herself. Identical to Beam Kirby's Revolution Beam from Return to Dreamland. Fair: 2 slaps forward with the paintbrush. Bair: Smacks behind her with the pallet. Quick but not very powerful. Uair: Spins the rainbow line above her in a tight spiral. 3 hits. Dair: Beam Kirby's Beam Blast, the dash jump attack from Team Kirby Clash Deluxe, but with heavy endlag and landing lag to balance it out. Halts momentum in the air, exactly how it does in the game. 5 weak projectiles diagonally downwards in a set spread. Grab: You know the rhythmic gymnastics with the ribbon where the gymnast spins the rod quickly from above to create a spiral with the ribbon? Just like that. If it grabs someone then a rainbow line surrounds the enemy, connected by the paintbrush. A tether recovery option but range on the grab is pretty basic, being slightly less than Lucas'. Pummel: The rainbow line constricts. Fthrow: Spins the opponent around Beyblade style then whacks them away with the paintbrush. Bthrow: Same as Fthrow but the opponent moves behind her as they spin. Uthrow: Beam Kirby's Capture Beam attack. 3 projectiles in quick succession in a steep angle diagonally forwards. Dthrow: She bops the opponent on the head hard with the paintbrush. B: Canvas. Adeleine summons a canvas as a thought bubble appears beside her (scaled to the size of the screen, so it's always visible). The bubble then cycles through what can be drawn. Pressing B has Adeleine draw the selected summon and it pops out of the canvas when it's done. Cycle can be cancelled and restarted at any time at the same position, but if something is summoned it reverts back to the first summon in the cycle. Only 1 summon onscreen at a time. Summoning something else cancels the previous summon. Here's a list of possible summons. Bronto Burt: First summon. Flies forward in an upwards arc. Shotzo: Shoots slow moving cannonballs forwards. Chilly: Moves forward until an enemy is in range, where it stops for a second then uses its ice attack in a wide range all around it. Sir Kibble: Throws a cutter blade forwards, jumps over that blade and throws another blade at the apex of the jump. Summon it backwards to get more range out of the cutter blades during their return. Ice Dragon: slides ice blocks along the ground that are affected by gravity. Good for edge guarding low recoveries. Whispy Woods: Last summon on the list. Summons a mini drawn version of Whispy, about the size of Villagers Tree. Whispy then proceeds to blow out a gust of wind and summon an apple which fall from the leaves, hurting anyone below including Adeleine. When fallen the apples can then be picked up and thrown for slight damage. Side B: Rainbow Line. pretty much the implementation of the rainbow lines from Kirby Canvas Curse along with a projectile ball that follows along the line, similar to how Kirby follows the line in that game. Upon activation Adeleine draws a line forward that can be drawn in any direction, even doing a loop-de-loop. When you let go of B or if the line reaches it's max range a ball appears at the start of the line and speed dash forwards until it reaches the end of the line, where it flies off as an arcing projectile. The longer the line, the faster the ball is as it leaves it, allowing for an almost unlimited choice of angles. Can be reflected but if reflected while it's on the line it continues the same way only belonging to the reflector character. Up B: Co-Kracko. Adeleine quickly draws a Co-Kracko, a smaller Kracko-like enemy with 4 spikes, and rides it similarly to a Lakitu cloud. Adeleine is completely open to attacks from above, as the spikes only cover the lower half of her hurtbox, so this recovery must be used strategically. Down B: Bumper Crop Basket. Adeleine quickly whips out the basket from the Kirby 64 minigame Bumper Crop Bump in front of her, just like how G&W holds the bucket. Any projectile or item that gets thrown into the basket is neutralized and disappears. This is a purely defensive special to deal with projectile heavy characters as you're trying to set up a summon. Final Smash: Kracko. Adeleine summons a giant Magical Paintbrush from Canvas Curse and swipes it continuously across the screen until Kracko is fully painted. She then jumps on top of Kracko as she now has full control over it. Kracko can move in all directions freely, though can't move through solid platforms. B is double thunder beam attack that circles Kracko, side B and up B shoots it fast in the direction chosen, and down B is the rain attack. <entrance>: The crystal from Ripple Star appears from the top of the screen and flies down vertically until it reaches the platform; near the platform, it slows down a bit doing a little bounce back, then it transforms into a star portal, and both Adeleine and Ribbon jump out from it. Just after coming out from the portal, the two character do that pose from the end of their victory dance in Star Allies, and the sound of a crystal shard is played in the background. Most of Adeleine's moveset unleash paint particles. Paint works like the Inkling's ink, characters who get covered in paint become more vulnerable to physical attacks. Differently from the Inkling's ink, Adeleine's paint is rainbow colored. <A>: It's Brush Slash from Kirby Star Allies. Adeleine slashes the paintbrush in front of her: at the beginning of the movement, she rubs it on the palette a bit, so it carries all the paint and releases it in the air just the moment after. This move has an hitbox on the paintbrush that launches enemies away doing some additional damage, a large hitbox where the paint is released, that has less throw power than the paintbrush itself but does more damage and covers the enemy with paint, and a small range of paint particles that doesn't damage the enemy but it covers with paint as well. <A>+<A>+<A>...: Adeleine chains more slashes in different directions, and at the end she just shakes the paintbrush left and right very fast, similar to what she does during her dash attack. This move becomes weaker as you use it, because the paintbrush will run out of paint and if you perform it for long enough, only the paintbrush hitbox will remain active. <forward>+<A>: Another simple slash, though this time Adeleine does a step forward in the process, extending the range; it's also a bit more vertical, so it also covers 45° above a bit. <up>+<A>: Adeleine faces at the screen and moves the paintbrush from left to right with an happy face. The animation is made in a way that it resembles that animation from Kirby 64 when she joins Kirby in the adventure, the same move that is also used in her victory dance in Star Allies. During this attack though, she does it a lot faster and with more energy, and she holds the paintbrush a little more above than usual, so that she actually hits enemies who come from above. As usual, paint particles are released with the same structure as before. <down>+<A>: nothing special, just another slash, this time it's close to the ground and can be performed faster (though it's weaker and has less paint range). <dash>+<A>: Her iconic despearate attack from the end of her bossfights. It's a bit different from Brush Force in Star Allies: this is the only character with a dash attack that can be charged. The moment you activate it, you can release it to make it start instantly, or you can hold A to charge it and make it faster and more powerful. It's also useful to confuse the enemy and do surprise attacks. When you hold the button, Adeleine does a rage animation, and becomes more angry the more you charge the move. The actual move works similar to Luigi's dash attack, with the difference that it doesn't carry the enemy, it instead makes you bounce back (stunned a bit) when you hit an enemy, and the enemy is launched away; a fully charged dash attack can be quite powerful. <forward smash>: It's like her forward attack, though it's stronger and releases more paint. <up smash>: It's like her regular up attack, but stronger. She does a little jump in place to extend the range, and release more paint. <down smash>: Adeleine rotates in place balancing herself on 1 foot, as if she's dancing. In the process, she draws a circle on the ground. A small amount of paint is released during the move, especially at the beginning (forward) and at the end (backward) when Adeleine stops herself from spinning, doing a dance pose and holding the paintbrush backward. The paint released on the platform will stay on the floor for a limited time, similar to the Inkling. <midair>+<A>: the second attack of Fairy Dance from Kirby Star Allies; Adeleine and Ribbon dance in air holding their hands and revolving on themselves. The attack is weak, but it does constant damage and stuns; it also lets you float a bit (you fall slowly for a limited time frame). <midair>+<forward>+<A>: It's still similar to Brush Slash, but in air. <midair>+<backward>+<A>: Adeleine performs a twirl. In the meanwhile, Ribbon orbits (horizontally, similar to Daroach's Doc summon) around her with a crystal shard in hands (also revolving on herself): when Ribbon moves behind Adeleine, the crystal shard shines in an orb of light, covering Ribbon as well; Ribbon does damage until the light orb around her disappears. <midair>+<up>+<A>: the first attack of Fairy Dance from Kirby Star Allies; Adeleine holds the paintbrush up, while Ribbon orbits around her, creating wind that makes her jump up a bit. In Smash, the moment when Adeleine slams the paintbrush up does a decent amount of damage, though, after that frame, the damage done is weak; on the other hand, the move still deals the paint effect on opponents. <midair>+<down>+<A>: Adeleine kicks down with both feet. It's a weak move, but it's very fast and has very little lag. <grab>: Adeleine "hugs" the opponent blocking him, Ribbon also grabs the opponent from a different angle, trying to stop him as well. <grab>+<A>: While the opponent is grabbed, Adeleine slams the opponent with her right arm, trying to not release him. Ribbon simply holds the opponent and does nothing else. All the throws start with Adeleine releasing the grab and drawing something on a canvas (that appears in that moment), while Ribbon launches the opponent up a bit taking some time. When the opponent falls back to the ground, the drawing made by Adeleine is summoned and it will attack the opponent. The canvas then disappears. <forward throw>: Adeleine summons a Pacto (an oval yellow creature with round eyes and pointed teeth, basically a mix of Pacman and a Chain Chomp from Mario); the Pacto bytes the opponent, then releases him, launching him forward. <backward throw>: Adeleine summons a Zebon (a semi-transparent blob that works similar to a cannon) that eats the opponent and shoots him backward/down: the opponent bounces on the ground and flies away. <up throw>: Adeleine summons a Tick (a round white enemy with a red spike on the top and a cute face; when Kirby is above them, they change the cute face to an evil face and the spike becomes a lot longer and more dangerous): the spike hits the grabbed enemy and launches him above. <down throw>: Adeleine summons an I^3 (a green-ish block with an eye on the side facing at the screen; basically acts like a Twomp from Mario) that falls on the opponent, doing huge damage. <B>: A canvas appears, and Adeleine draws on it. Midair, the move can't be charged, and instead of the regular canvas, a smaller version of it appears: Ribbon holds it in order to let Adeleine to draw in air. When you draw in air, you fall very slowly and your horizontal movements are canceled (though the drawing times are very short and the move has long endlag so you can't abuse of it). Each summoned small enemy counts as a projectile, and it explodes in paint on impact with a character. by default, Adeleine draws a Waddle Dee on ground, and a Bronto Burt in air. If you select a direction (up, down, right, left) after activating the move but before Adeleine draws on the canvas, you can select different things (you see the options appearing all around Adeleine, in a similar way as the Monado Arts of Shulk). This only works when you are on land; midair you can only summon a Bronto Burt. By the way, you can only have up to 3 small enemies on the stage at the same time, if you draw a new one, the oldest explodes. -no direction: Adeleine summons a Waddle Dee: it walks forward. Occasionally it may slow down a bit and do a little jump. -forward: Adeleine will draw a Batamon: it works like a waddle dee but it runs faster and doesn't jump. -up: Adeleine will draw a Bronto Burt: if summoned on land, it will fly up first; when it reaches a certain height, it will start flying forward with a wave-like trajectory, going slighty up and down. If summoned midair, it will start with the wave trajectory from the beginning instead. -down: Adeleine will draw a Bouncy: it will slowly move forward, covering some vertical space as well by bouncing. -backward: Adeleine summons an item. if you select backward, you will draw an item instead! Usually it's food, and it lets you recover a small amount of %, though it can randomly be a different item or even a maxim tomato! There is a limited selection of items that Adeleine can summon, not every item is avaliable. Keep in mind that you must grab the healing items before your opponent steals them to you. If you eat an healing item, the chances to get another one are decreased for a while, and it may happen that you will summon Mr. Saturn a lot of times instead. The item that you will draw is random, though you can see it before summoning it, from the GUI around Adeleine when you activate the move. If you charge the move, you can draw a boss! You can have only one boss at time, if you draw a new one, the previous one explodes in paint; summoning a boss also makes any of the small enemies explode as well. All the bosses are smaller than their real versions, they are just a bit bigger than Adeleine, except for Whispy that's a bit bigger maybe. -no direction: Pon & Con. Pon & con jump out from the canvas and run in two different directions. Who goes left and who goes right is random, and how many of their sons will follow them is also random (0 to 4), though they are very fast and explode as soon as they touch a character or a wall, or recive damage somehow. -forward: It's Ice Dragon! Adeleine rides it and she can perform the same moves she can do in Kirby Star Allies. Ice Dragon lasts for 5 seconds, then explodes. It can be destroyed with enough damage, and Adeleine can still takes damage while riding it, she only ignores the knockback (only if Ice Dragon survives after the hit). The moves are performed by pressing the directional input and A, while B will make Ice Dragon explode in a cloud of paint instantly. Many features such as shield and grabs don't work while riding Ice Dragon. Ice Dragon's moves are powerful but a bit laggy, since Adeleine must give orders to him and he has to react. -backward: Adeleine summons a Whispy Woods. It works as a wall, though you can go through it with a dodge. It's behavior is random: occasionally it will blow some air and push characters away (including Adeleine); other times it may shot those air puffs that do some damage (opponents only), or create some apples that work like in that Melee stage. It's useful as an obstacle to slow down opponents and keep them at a distance, but it doens't do much damage by itself. It's about as big as Villager's tree, and it spawns behind Adeleine. It stays on the stage for 10 seconds unless it's damaged enough. -up: Kracko. It goes above Adeleine and stays in place the whole time. It defends the area with his rotating lightnings and if an opponent walks under it, it will shoot a lightning down or slow down them with some rain (that only stuns, doesn't do any damage). It lasts for 5 seconds like Ice Dragon, and it can be defeated more easily than Whispy. -down: Magman from Kirby 64. It appears as a small blob of lava crawling on the ground. If an opponent walks on it and the platform is large enough, Magman will come out from the floor, launching the opponent right above himself. That's all what he does, then it disappears... it's basically a trap with fire elemental effect. It lasts 10 for seconds or until someone falls into the trap; can't be defeated. <left/right>+<B>: Ribbon lifts Adeleine and let her fly a bit; in the meanwhile, Adeleine shoots crystal shards with the crystal gun. Even if you activate this move on land, Adeleine still floats with Ribbon, close to the ground. This move acts similar to Bowser's fire breath, when you use it, then you need to wait until it recharges. You can shoot up to 5 crystals at time, then the move becomes weaker and will let you shoot only 1 crystal at time, until it slowly recharges again. Each crystal shoot will let you fly for 0.5 seconds, so if you shoot all 5 crystals at once, you can fly for 2.5 seconds (though you fly slowly). While flying, you have free control of the movements, you can move Adeleine and Ribbon with the directional input; as the fly time ends, the characters will simply fall. The move has an huge endlag that's canceled once you land on a platform. The fly is not interrupted as long as you chain the crystal shots fast enough, and it preserves the facing (if you shoot the first crystal facing left, all the other crystals will be shoot left too, until the fly is interrupted). The 5 crystals are represented near to the character's icon in the GUI, so you can always see for how long you can fly. <up>+<B>: Adeleine enters a star portal and the crystal appears. Ribbon flies aboard the crystal for a while, then the crystal transforms itself into the star portal again, and Adeleine comes back. The moment when the star portal appears (both at the beginning and at the end of the move) it has an hitbox, because it summons an orb of light that does some damage in the process. While flying, you can do some damage by ramming into the enemies, though they can hit the crystal as well, and if the crystal is broken, Adeleine will get damage and fly away. This move is inspired by the opening cutscene of Kirby 64 and the scenes of the story when the characters travel from planet to planet using the crystal. <down>+<B>: Adeleine slams the paintbrush on the ground, generating a wave of paint that carries the opponents away for a while. This move doesn't do much damage, it's useful to keep the opponents at a distance (it works similar to water moves). Though, it gives the paint status to the opponents. If activated in air, Adeleine will freefall with the paintbrush downward until she hits the ground, then the actual move starts; enemies hit by the paintbrush while falling, still get some weak damage. This move is inspired by the minigame Checkerboard Chase from Kirby 64. <shield> Adeleine holds the palette in front of her. <dodge> Adeleine's dodge is clumsy. The in-place dodge is regular, while the side dodge is slower and has less invincibility frames than most dodges from other characters. Though it's special: when Adeleine dodges a player, she stuns it the time necessary to deal a simple attack! She basically bumps into the opponent and makes him/her lose balance a bit. If there are no players though, the one who loses balance is Adeleine herself, and the effect is similar to a missed dash grab (inspired by the minigame Bumper Crop Bump from Kirby 64). <edge climb>: Ribbon helps Adeleine climbing the ledge by pulling her arm. <edge attack>: Adeleine climbs the ledge, in the meanwhile, Ribbon performs an attack similar to the midair backward attack to clear the space close to the ledge. Ribbon can't be attacked, but Adeleine can. <final smash>: Adeleine and Ribbon summon the crystal. The crystal shoots a laser just in front of itself; if it misses, it disappears in a fraction of second, but if someone if caught up by the laser, that player will stay stunned for a couple of seconds, getting its health drained by the laser. It does huge damage and leaves the opponent in broken shield status, but it has no knockback, so you must go close to the opponent and hit him with a smash attack in order to kill him. If performed midair, the opponent will first fall to the ground, then stay in broken shield status; if there is no ground, it's a free stock. You can only attack 1 enemy at time with this move, but opponents who move through the laser when another opponent is under the attack, get some % of damage too and are stunned a bit as well (still a weak attack compared to what the target is getting). Use this carefully because opponents can easily steal your kills. This move is inspired by the true ending of Kirby 64. (I wanted to make this something like, Adeleine draws an awesome boss such as Zero2 or something, rides it through the stage and creates massive destruction, but since Smash Bros Ultimate made the final smashes simpler and removed the transformations, I decided to use the crystal instead). <up taunt>: a short version of the victory dance: Adeleine dances a bit and at the end she winks. <left/right taunt>: Adeleine and Ribbon do the high five scene. <down taunt>Adeleine grabs a sketchbook and does something while Ribbon is watching interested and confused. At the end, Adeleine shows the drawing at the screen, it's a cute drawing of Ribbon, ribbon starts laughing, a bit embarassed. In 1v1 matches, there is a chance that Adeleine will draw a portrait of her opponent instead, and Ribbon will clap happily instead of laughing. <idle animation 1>Adeleine adjusts her hat and hits her dress with her hands a bit as if she wants to remove some dirt/dust. <idle animation 2>Ribbon flies around Adeleine a bit, and she follows her with her eyes. <idle animation 3>Adeleine rubs the paintbrush on the palette to grab some paint, slighty moving the head left and right with a calm and happy expression. <near edge animation>: Adeleine looks down the ledge. At first she's a bit scared, her hat jumps a bit over her head, then she changes expression and starts looking down with an interested and impressed sight, as if she's amazed by the landscape. <victory animation 2>Adeleine is on a wooden log, surrounded by the animal friends (including the Dream Land 3 ones) and Gooey. She finishes her drawing, then she shows it to the camera with an happpy face, and the crowd claps at her. The drawing is a group portrait of, indeed, the animal friends and Gooey. <victory animation 3>It's the picnic scene from Kirby 64, with the exception that Kirby and King Dedede are missing for obvious reasons. Adeleine and a (regular) Waddle Dee eat food (the same food from K64) and Ribbon is in the middle of them, watching (there is other food on the floor, on the picnic cloth). Adeleine jumps up and does a small victory dance (still with the sandwich in hand) and she becomes the focus of the scene, with Ribbon still visible, waving off at the screen. <lose animation>Adeleine has a sad face, looking down, and Ribbon is near her, trying to comfort her; you can see Ribbon talking but nothing is heard. General info: Adeleine and Ribbon fight as a tag team duo, both always visible on screen. Ribbon spends most of her time riding Adeleine's shoulder unless stated otherwise. The two are rather light, and have a slower than average fall speed on top of that, but make up for it with plenty of options for field control. Jump: First jump is shorter than average, has two additional jumps however with Ribbon's help. Shield: Animation from hiding behind her canvas. Dash: Closes her eyes, waving the paintbrush back and forth. Will bounce off an enemy rather than running through them like normal dash attacks. Jab: First two hits are swipes with the paintbrush, followed by Ribbon whacking the opponent with a crystal. Down tilt: Adeleine jabs her paintbrush along the ground while Ribbon does the same behind them with her crystal. Waddle Dee: Runs forward, jumping occasionally. Waddle Doo: Tuns forward, and sometimes stops and fires a magical beam from its eye. Can deal decent damage if the beam connects. Wheelie: Drives very fast, running and pitting anyone it hits until colliding into a wall, which in then explodes. Sword Knight: Immediately dash attacks forward, sticking any enemy it hits onto its sword, then slashes upwards, smashing them away. UFO: Very rare. Zooms around the stage, targeting opponents with its strong laser attack. Adeleine runs forward, swinging her brush around frantically. Can destroy most incoming projectiles and when she hits an opponent, they take little damage and are pushed away. When hitting a wall, she is temporarily stunned. A canvas appears behind Adeleine and she quickly hides behind it. She can then do any of the following. Press the (B) button to kick it down, pitting anyone hit by it and pushing away anyone near the sides of it. Hold the (B) button to cancel into Quick Draw. Press the evade button to simply come back out. Press (A) to jump onto the canvas, which makes it a temporary platform. Press any of the taunt buttons to perform a small tantrum (Kirby 64). Ribbon grabs Adeleine and the two ascend. You can freely move around the stage, however keep in mind that it doesn't last forever. Similarly to Ike as a heavy swordsman and Rosalina as a puppeteer, Adeleine could be chosen due to her summoner potential and then expanded on from there. While until Kirby Star Allies Adeleine hasn't appeared in a Kirby game since Kirby 64, her main character status from that game and her moveset potential could see her rise to become one of the best Kirby reps. Her ability to represent Canvas/Rainbow Curse also adds to her chances. Also, before the announcement of Adeleine as a Dream Friend in Kirby Star Allies, she was very requested on Kirby's Japanese Twitter profile, and in a Switch post, HAL aknownledged that Adeleine (and Ribbon) were once important, and both still have a dedicated and long-time fanbase. Lastly, Adeleine is able to summon creatures from different games, old bosses and enemies, especially from the Dark Matter trilogy (Dreamland 2/3 and Kirby 64); with a single character you can represent a specific series of games, that in Smash are still unrepresented, despite being part of Kirby's classics. Special thanks to Luminario , the original author of this post (I only updated and added stuff to it, some parts still come from the original post). Well, that certainly took a while! I've been waiting for a support thread for this little lady! I so support! Adeleine may not be a popular or likely choice for Smash, but with an action fighting game coming this winter, there could be a chance of an appearance of Adeleine in a Smash like game! I don't know if I can be of much help, but I can try! Count me in as a supporter for Adeleine too, she may gain some more popularity if she appears in a Smash Bros game. Still support the painter girl. She needs more love. Adeleine has the potential be a very unique character with a plethora of possibilities, like being an actual summoner for example. I most certainly support her. Oh yeah I support! I was planning to open a support thread for Adeleine sooner or later, well I was waiting for more infos about that Kirby fighting game, though I'm happy that someone else did it, it means that I'm not the only one who cares about her! Found this while image surfing and figured y'all would like to see it: a fan-made render of Adeleine. This is by far the best one I've ever seen. And I don't know how old it is. Didn't bother to look. So maybe you've seen it too. Not being a Smash Bros. player much anymore, seeing the graphical upgrade of characters is what I most anticipate, along with remixes of previous music. I don't see this happening probably ever, at least not before Bandana Dee. That doesn't mean I wouldn't like it, though. I loved Kirby 64 and always loved Adeleine. She could also be a blast to play as. For the next iteration, best case scenario would probably be getting Bandana Dee as playable and seeing Adeleine represented somehow, whether it be sticker, trophy, or AT. I would be more than happy with that, which would do a lot to get attention shifted towards her. Honestly, I hadn't heard of this Kirby fighting game until reading this thread. This could present a possible opportunity to get her some relevance if she can get some kind of inclusion. Luminario Among Waddle Dees (I added you as well because I know you care) I want to say something important: I was the owner of the previous 2 Adeleine support threads, and during my personal experience, I had this issue: I found a lot of supporters, though, most of them just wrote a post and disappeared forever... at the end, I was almost always stuck with the last post, being unable to post again without double-posting. So please, if you are really interested in supporting Adeleine, don't stop supporting Adeleine, come back to this thread and support the character occasionally, I will do it as well. Now, back to the character... I want to make a summary of the growing relevance of this character recently. Adeleine (or Ado) first appeared in Kirby's Dreamland 3; she was just a boss, but in the true ending of the game, she had her moment of spotlight: she is represented as the main character, surrounded by every other character from the game, drawing pictures of them in the credits cutscene, and at thend, she's the one writing the "END" text on the screen. In Kirby 64 she became a main character, and part of the crew who fought the Dark Matters and saved Ripple Star. She was playable in the minigames, and in the beta of the game she was also planned to be playable in the main story, but the feature was scrapped in the final game. During the development of the Kirby anime, Sakurai said to the staff that he didn't want any human character in the series, many fans think that this is the cause of Adeleine being neglected after Kirby 64. Some fans even thought that Adeleine was retconned and she was not canon anymore, along with other characters from the Shimomura directed trilogy (known by the fans as the Dark Matter trilogy). In Kirby Triple Deluxe, Adeleine (as Ado) appeared in two rare keychains; she remained unnamed, as one of the keychain represented the Boss Butch mode of Kirby's Dreamland 3, and the other was called "Sweet Stuff Drawing", despite Ado being in the picture. The game "Amiibo Tap", a game on WiiU that used the Amiibo statues to unlock demos of Virtual Console games, included Kirby's Dreamland 3, and had a scene dedicated to Ado's bossfight. In Kirby Fighters/Kirby Fighters Deluxe, Adeleine's fight theme was used as background music of the ability select screen; in the Deluxe version of the game, it got a small remix while in the Triple Deluxe minigame version it was just a rip of the original; Later, Team Kirby Clash Deluxe used the music from the Adeleine introduction cutscene in the Miiverse and Amiibo screen; there's a rumor that some hackers looked at the title of the music file in those games, and they included the name "Ado K64": this is an unofficial confirmation that Ado and Adeleine are intended to be the same character, if it wasn't already clear enough. In Kirby Planet Robobot, Adeleine got a rare sticker; this time, she has got her name as well! Adeleine got 2 new official artworks for the first time since Kirby 64. On the day of Kirby's birthday, HAL changed the banner of the anniversary Twitter account and website, and the new banner has Adeleine in it! Later, in the same day, they released a 3DS theme with the same picture (Japan and USA only, no Europe sadly); Adeleine is in it! HAL announced a Kirby themed multiplayer fighting game for 3DS, to be released this winter. Nothing is known so far, but if fighting game means characters roster, it's possible that Adeleine will get a spot in the game! Let's hope! Ah, thanks for letting me know! Sure, I can try to support her as best I can, but again, I don't know how much help I can be. I'm honestly kind of surprised she gets support for Smash, considering how unlikely a chance she has right now. Depending on how they handle the mysterious new Kirby game, that could easily change, but as you said, she hasn't been relevant for years, and only now is she beginning to get promoted from the developers of the Kirby series. Yet some people have been clamoring for her inclusion well before that. I kind of want to talk about how I began to support an inclusion of Adeleine in Smash, but I'm not sure if people would want to hear it and I worry that might be off topic. Among Waddle Dees Don't worry, just contributing to the discussion is enough! Talking about how you started to support Adelenie in Smash is totally in-topic I think, and it would be interesting as well. Also, moveset ideas, concepts, drawings, cool fan arts, etc... everything is welcome! Anyway, there is a lot of time to support her, the new Smash is not even announced, so, there is no need to have very high activity in the thread, just some occasional activity to keep the thread alive is enough. There are many characters from the Kirby series who have the potential to become Smash fighters, Adeleine may not be the one with the biggest chances, but this shouldn't stop us to support her. Even just a trophy or assist trophy status may help the character to gain back the lost popularity, though, being playable would be the best scenario and the one I'm hoping for (and everyone else in this thread I assume). Even if at the end she doesn't get anything, this is still helpful to increase the character's popularity, and increase the chances of a return in the future. Apparently Adeleine has a small, silent but solid fanbase, this is why there is always someone who supports her, no matter how unlikely it is for her to reappear in a game. Yeah that's alright. Think I've seen it before. Her eyes make her a bit china doll-ish but besides that, its alright. Though if I'm to be honest, I don't believe Adeleine needs a redesign anyways. She fits very well in the modern Kirby universe still. Loving the compiled history of Adeleine, would you mind if I add it to the OP? Actually, would you like to be in charge of this thread instead? I mean it's only fair seeing as you were the owner of the past 2 and I only made this thread the time I did because I made a moveset for her like I do with all characters I support. Luminario I don't mind you being in charge of the thread, I have no problem with that, but if you prefer to switch the role with me, I have no problems either, just make your decision... it's fine either ways for me. You can put the history of Adeleine in the first post, I'd be glad if you do! Added to the OP~ And I have no idea how to actually pass on ownership. Back onto Adel, do you think she should have her own stage? I'm thinking of a Kirby 64 traveling stage that goes through each of the worlds. Also on the topic of design I think that she should be designed with the hairstyle from Dreamland 3 for Smash but with something similar to the outfit re-design that Iko did. I want a stage for Adeleine, it would be cool if we got a stage based on her berry shaped cloud palace or something. The only problem with that though is that it might not work if Adeleine were to be a fighter. She would probably need to be a stage element for the reference to be fully realized. Of course, we could always use Alfonzo when Adeleine is battling on the stage. Also, I kind of think she should have both her Dream Land 3 and 64 design as options. I think people need cemented evidence that "Ado" is the same character as Adeleine. I'm not sure if a redesign is necessary, though; I think she is perfectly stylized to be a Kirby character. I think that her Smash model would have more details, like Metaknight and to an extent Dedede (or other characters from other franchises, Peach and Rosalina come to mind); though she's still a Kirby character so she would still remain simple enough, she won't have much more details than the Earthbound/Mother characters. I agree about the ability to switch from K64 to Dreamland 3 designs, if not completely, even just the hairstyle and the color palette. About the stage, I would go for a more classic and simple location, Quiet Forest (the forest level where you meet Adeleine in Kirby 64), or else that futuristic pyramid-spaceship thing that appears in both Dreamland 3 and Kirby 64, for some reason I think it would be a cool stage and at the same time it would represent Adeleine well, since there are many elements based on colors, including PIX (in the K64 version of the stage). On the re-design thing yeah I only meant give her the Peach/Rosi treatment and give her frills on her skirt along with the Ado hair, simply cause it'll look more fashionable. Her base design lets her immediately stand out amongst the rest of the roster anyway. We could always get a Canvas/Rainbow Curse stage that's sort of like Pictochat but more Kirby. I still prefer the traveling Kirby 64 stage though that game has good material for such a stage. The Japanese Nintendo magazine, this month will be all about Kirby's 25th Anniversary, and it will include 3 reversible posters, one of which is about Kirby 64 and Adeleine is part of the artwork. She's a bit covered by text but she's still there, BTW. I want to know more about the fighting game, if Adeleine is in that game, her chances to appear in Smash are like 10 times bigger than how they are now. Same here. I mean, there's the possibility of it not helping anything. But I suspect that won't be the case. Still, we know next to nothing about the game other than the genre, and I've been curious as to what the game will offer. I'm assuming that Japanese Nintendo magazine didn't offer any clues? I'll be busy when the Nintendo E3 Direct launches and assuming it will have the game officially announced, I may have to settle with a delayed reaction. The genre itself makes the possibilities so high, specially because is a celebration game (and the magical "25th" that everyone loves). Adeleine goes a bit like a ninja in the animation, "teleporting" from a place to another, like a very fast movement... well she does it in the original games too, especially Kirby's Dreamland 3! The enemy drawn in the animation is a "Tick" a very common enemy in the Kirby series, introduced in Kirby's Dreamland 3. I really like it. I'd love to see Kirby enemies pop up throughout Adels moveset in this kind of way, she's pretty much the only character who has the abilities to make this a reality too. Nice idea, I think it would work well. I think it would be interesting if Adeleine used her quick movements for some of her attacks. Though it does seem like a bit of an odd grab, don't you think? I would assume she wouldn't grab with the hand carrying the paintbrush. Otherwise she'd be whacking the opponent with her palette! Anyway, sorry for not posting regularly, I've been lurking here occasionally but haven't seen an opportunity to respond to anything. I must say, I'm not entirely on the Smash hype train right now. While I do want to see another Smash eventually, I'm lightly hoping Smash doesn't get revealed this E3 so that Adeleine has better chances. I know there's no guarantee she'll be in the action-fighter game, but unlike most Kirby games the chances are higher. Meanwhile, the chances of her getting into Smash are currently still minimal. I could see Adeleine in a Smash game in the future if she really is playable in the new action fighter game, but not if Smash is announced at this year's E3. I support Adeleine! Always will! Suprised this comic hasn't been posted yet. I've seen this comic before, but don't really have a strong opinion on it. It's an idea, I've heard it's mostly a joke, but if this comic were to predict the future, I think it would be a shame if most of her attacks were generic paint. There's a lot of potential with the art-to-life callbacks she could have. I feel like Brawl in the Family's interpretation of Adeleine is kind of... eh. She makes a good supporting role for the rest of the cast, but doesn't really stand out much in that comic. It's too bad Brawl in the Family had to end, as it was the only piece of consistent material starring her at all for a long time, and it ended not long before my hopes and dreams almost got completely crushed in the following months. I think she is not holding the opponent with her hands, it's more like a hug XD well, there are other characters who grab with stuff in their hands, and since Smash is not much realistic, you may potentially temporarily make the palette disappear while grabbing the enemy. BTW I made an error in the animation, one of those things that once seen can't be unseen: in the last scene, the paintbrush and the palette are switched, she's holding the paintbrush with the left hand instead of the right one! About not posting regularly, it's all right, as I already wrote time ago, there is no need to make a huge amount of posts, just once in a while is good. When there is low activity, I sometimes don't reply because the risk is to get stuck as the last post and if I want to post again I need a double post, so if I don't reply often it's because of that, I want to save my post for a more useful purpose; I still read anyway. Currently the chances of Adeleine in Smash are low, but this is the point of this thread... some years ago the chances were even lower, if Adeleine is getting some relevance recently it's also thanks to the requests of the fans... you know what happend with that guy on Kirby's 25th anniversary Twitter. So no matter how low her chances are, this will help anyway... I have seen characters like Takamaru and Prince Stable getting threads here on Smashboards and then getting an assist trophy despite their low chances, and even Geno got his Mii costume despite the copyright problems with Square. Don't ever lose your hopes! I'm not a fan of Brawl in the Family, honestly... I think that in this comic the author is mostly making fun of the concept of Adeleine in smash, using it as a gag, he seems to think that she wouldn't even work at all... and this annoys me a bit. Adeleine has definitely the potential to become a very unique fighter in Smash, she has the skills and the resources to build a moveset over them, the only thing stopping her from being in Smash already is that huge amount of time she has been neglected by HAL. A damaging hug, eh? That's not really part of her character, I would think, but I'll go with it. I doubt relevancy is the only thing stopping Adeleine from becoming a fighter, although that problem is likely the main reason. If you promoted her back in the Melee days, people probably wouldn't have supported her. I wouldn't have heard of her then, to be fair, I only learned about her in 2008; in fact, I learned about Nintendo from Melee. Her best chance of appearing was in Brawl, where she got nothing, not even a sticker. From there on out her chances of getting in got slimmer and slimmer. Certainly I wonder if timing and bias had played their roles in the absence of Adeleine in Smash. If everything pans out the way I hope it does, Adeleine will be introduced into the action fighter game and eventually promoted into Smash via pure potential. That's another reason I want the Switch iteration of Smash later: if Adeleine in Smash is promoted too early, we might have a Corrin problem. I feel the need to remind... myself, mostly, that Adeleine's return is still mainly speculation. It would ironically be much more odd if she doesn't appear in Kirby's new action fighter game, solely because of how much they've referenced her lately. But for both that game and Smash, there isn't much more than an anticipation of things to be announced. No Adeleine so far, but the new Kirby game for Switch looks very cool! It also brings back some elements from the Dark Matter trilogy, such as Nago, the Clean ability, and power combinations (but it looks to be limited to elemental power ups). They have not shown anything about the new Fighting game for 3DS, maybe later in the Treehouse? It remains a mystery if Adeleine is in the fighting game or not, I remain hopeful, maybe given all the Dark Matter trilogy throwbacks in the new Kirby Switch, she manages to appear as a boss in that game, or in some other ways? Today I was hoping for some confirmations but apparently we must still wait, though the announcement is cool so I'm not disappointed at all (I love the new Kirby game, I already said it?). ...I'm nervous. Nothing was said about the action fighter game yet and the Switch game, while admittedly pretty and interesting, didn't show Adeleine at all. True, they didn't showcase any concrete Kirby character besides Whispy and Kirby, but what are the odds of her getting replaced again? I could see it happening... I could easily see something go wrong and Adeleine being left in the dust again. At least Smash wasn't revealed yet, giving time to promote Adeleine again, but what's the point if she isn't being acknowledged as a game character? I guess I have no choice but to wait for more details. Well people, don't be afraid too soon, the Spotlight wanted to focus in the Switch Games, we still have the Treehouse to see 3DS news (like that Metroid 2 Re-imagination). The last day of Treehouse finished just now, and they revealed nothing about Kirby... I wonder why they decided to show us the 2018 game and not the game that should be released this winter... it's odd, I hope it's not getting canceled nor delayed. We still don't know anything about that game and it will be released in a few months, it's very strange... maybe they will do a Kirby direct soon? I hope. Seriously? I waited two months for an announcement that still hasn't arrived?! What's going on here?! If Adeleine was in a new game, they probably would've shown her role by now. The 3DS theme was nice (still not sure why Europe didn't get it) but part of what I was hoping was that she would be picked back up by the developers and the absences would finally come to a halt. Adeleine in Smash would make me anticipate the next Smash more than anything else, but the revitalization of Adeleine's relevancy is what I ultimately want to see. Someone help me. I'm on the verge of losing all patience.